Our good friends at Tommasini are working with L'Etrusca, an Italian retro-tour that began in 2013. It will run April 9-10, 2016 from Bolgheri, west of Florence and the routes range from a 27 km "L'Elegante" to a robust 160 km ride with lots of gravel. And attention, Gran Fondo overchargers: the cost for the long route is 25 Euros if you register early! 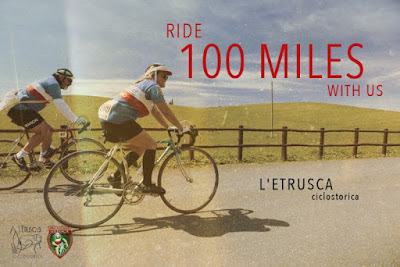 Information about the ride (mainly in Italian) can be found here. Until then, enjoy this video!